Bedside tables are ideal for keeping everyday items. They come in handy for storing things that are required close by for day-to-day usage. Be it a glass of water or emergency medicines, keep them handy on a side table. Pick the one that fits your budget and also goes well with the rest of your home décor. 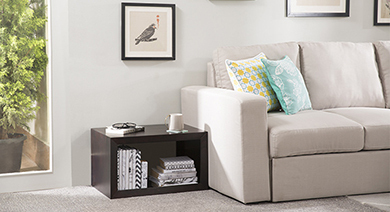 If you are up for buying a side table, you will be daunted by endless options online. Some are available in the form of a chest of drawers, while others may have open shelves along with a single drawer. Moreover, you will come across different sizes of side tables, which are custom defined to be trendy and durable. If you want a simple one, we recommend a circular or a square side table. You will also come across triangular or hexagonal shaped tables that can be easily placed in the corner. Keep in mind the purpose for which you are buying a side table when taking a final decision. Since these tables are generally meant for everyday use, you should get a scratch-resistant wooden table. A wooden table will be relatively sturdier and will also last longer. The sleek design of these side tables will go well with the rest of your bedroom furniture such as dressers, mirrors, and more. 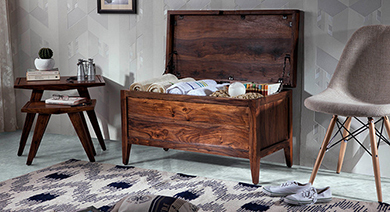 Additionally, these chests of drawers are spacious enough to store various items. In fact, they can double up as your wardrobe too! Also, you can use their table tops for keeping mementos, photo frames, or table lamps. 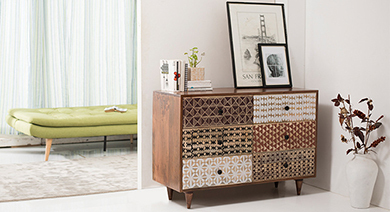 For your smaller rooms, compact bedside tables prove to be perfect. Side tables with tapered legs look really good in a couple's bedroom setting, and act as storage space for bedroom essentials. In order to keep your wooden bed side tables in prim and proper condition for a long time, use coasters before placing your coffee mug on them. Invest in a quality bedside table and keep your knick-knacks in place. Checkout our wide range of tables made of sheesham wood, rubber wood with veneer finish, and other accessories online, yes, they are all available at unbeatable prices.